This song is written from the perspective of a doomed young Irish rebel who is about to sacrifice his relationship with his loved one and plunge into the cauldron of violence associated with the 1798 rebellion in Ireland. This tune sounds very cool when played fast, but as always you'd better start playing slowly and carefully to prevent the formation of bad habits. 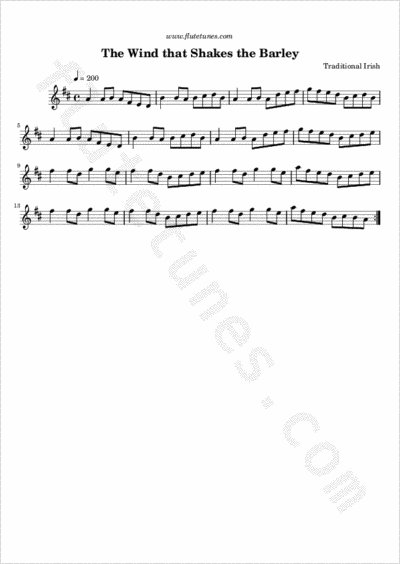 When playing you will probably notice that the tune as written in the sheet music doesn't have a real “end”: it's just made up as a never-ending loop. So when you want to stop playing what you should do is inventing a simple “coda” that brings the melody to an end, and since the piece is in D major this coda should end on a D. Of course this coda might just be a single D placed at the right spot; but with a little fantasy you'll surely find out more complex endings. Have I ever told you that often improvising turns out to be incredibly fun?